Expected Returns: Historical performance of 16.8% gross yield with 9.6% defaults. Sell Out: Yes, secondary market. Cashback: £10 on valid registration via this link. Speed of Investment: Fast via secondary market, but not huge quantity of new loans. From this table, it’s clear to appreciate the real risks of bad debt. However, it’s hard to measure the true loss from a default as many loans pay back both interest and capital each month. So these loans may have already paid back a significant proportion by the time they went into default. Our model creates a community where borrowers and lenders alike are invested in the businesses’ success and growth. Once registered and logged in you’ll be awarded with ‘trust points’ that can be gained through activities like connecting your Facebook account and lost through late payments or account inactivity. These are awarded to both lenders and investors, but as an investor I’m not sure in practice what benefit my current points have. When it comes to features Rebuilding Society has it all. There’s a ‘bidpal’ function to automatically invest in new loans. There’s a secondary market with the ability to set discount or premiums up to 5% either way. You also have the necessary tax statement that breaks down interest and capital gains. Finally, the dashboard pulls together all your data and calculates various measures. If anything the dashboard is a bit of an overload, it has 10 different calculations like gross/net return, transaction loss, actual loss and others. These are presented in a nice looking 5 x 2 grid, but would probably more make sense as lines of accounts. The founder of rebuildingsociety, Daniel Rajkumar, is a internet entrepreneur who had previous success founding the translation company www.web-translations.com. This background surely helped with the technical side of building the website and keeping costs low. For me, it’s sometimes a worry with P2P platforms that spiralling IT costs could lead to risks of the platform itself running into financial trouble. However with rebuildingsociety I personally feel that there is less risk on the IT side. When I looked at the website code itself, I saw they’d started with the Wordpress content management system and a couple of well known plugins to manage members/ contact forms and finally added their own customised plugin on top. When I did a little more research I found they’d been so successful with the website they were white-labelling the solution to others like eMoneyUnion. My only issue with the website is that for me, as a new customer, the initial bid process was confusing. Somehow I accidentally ended up investing twice my desired amount in the same loan when I wanted to invest to two different businesses. To make matters worse, something happened to the business repayments which meant that I was unable to sell on the secondary market. With rebuildingsociety you get a website with lots of functionality. In my opinion there is less platform risk due to its relatively longer history and how the website was built. I would hope that they can subsidise the costs and invest in ongoing maintenance through releasing it as a white label solution. However, there is still a significant investment risk due to late payments and defaults. In my instance, after my unfortunate mishap on the unwanted loan duplication I will wait to see how repayments progress before adding more funds. Rebuilding Society got in touch with me to explain the unwanted loan duplication/ double booking problem. 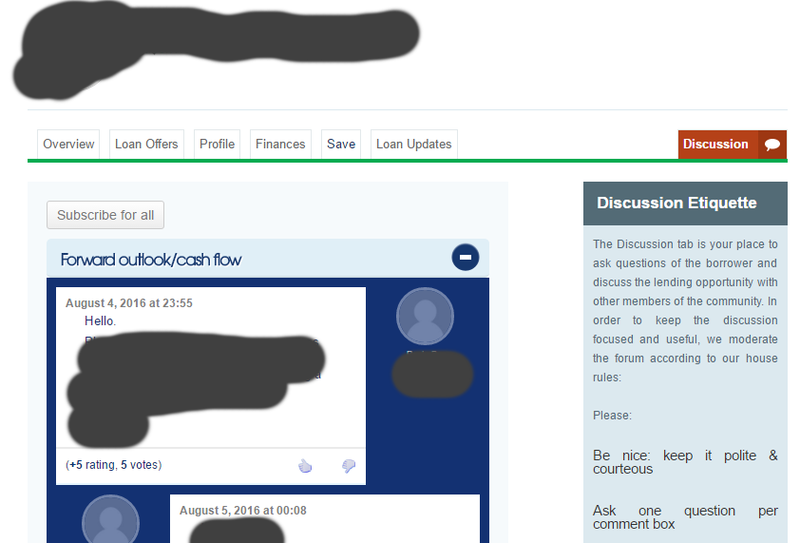 Apparently it may have been due to me having multiple sessions open at the same time (I usually open different loans in new browser tabs while I decide what to invest in). They were really helpful and suggested to reach out to them if this happens in future so they can try to correct it. You are an active investor in Rebuildingsociety or have been in the last 6 months. Just wanted to say thanks for the nice reviews and analytics. This is helpful to me as an investor and p2p blog author (german language). By the way I like the design of your blog. I spotted tablepress, and will use that as well. I’ve had a look at your p2phero.com blog too – very useful info for the Euro based sites I have yet to explore! Thanks for the review Neil, would you like to join our affiliate programme whereby referred users get cashback and you also earn a small incentive. Please take a look under the Partners tab next time you login. Please feel free to send in any suggestions on thing we can do to improve your investment experience. This is not a widows and orphans fund. It is a well designed site and, with interest rates of up to 20% on offer, an exciting place to do business. But at such stratospheric levels it is little surprise that more than a few of its loans go belly up. After a year’s investing, according to their figures, I am showing an average return of about -6% (yes, that’s a minus). I should add that it is partly my fault in that I initially didn’t spread my investments evenly. Their reporting on struggling loans was poor but has improved of late, I have decided to move my money as and when I can to safer ground. It is a shame that your caution prevents statements of real concern about reviewed platforms from being aired to warn new incoming investors of real dangers. I would add, if lenders do not fully understand the loan process on any platform over its entire life then do not invest. If, when you find statistics stated on any platform that are inconsistent to other platforms them take with a pinch of salt and do more research. Seek user reviews in chatrooms. Do not assume that all loans on the secondary market will run to term and give you the stated return on any site. Dig deeper. Ifisa wrapper is not a badge of safety. Losses inside an ifisa cannot be offset against gains made elsewhere for tax purposes.